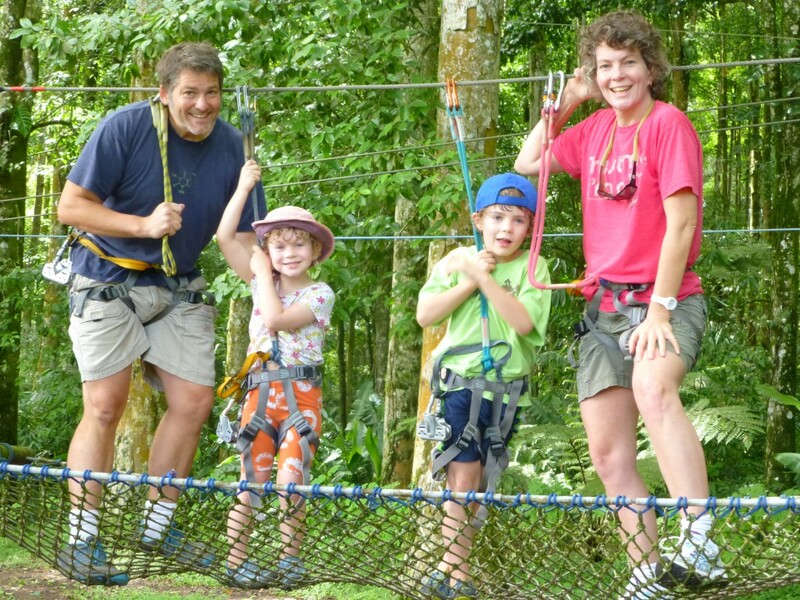 Bali Treetop Adventure Park is a fun activity set in an open air environment for group and family in Indonesia. Open daily for individual or group from 8.30 a.m to 6.00 p.m. in Bali Botanical Garden, Bedugul. We also provide you with company outing and team building services. 7 Adventure Circuits from one tree to another with height range between 2-20 meters. 72 challenges for all level and ages : Suspended bridges, Spider Nets, Tarzan Jumps, Flying-Fox, Flying Swings, and many more fun challenges. 12 flying fox up to 160m long. ENVIRONMENT All circuit platforms are held in place using an innovative compression system to protect trees from any damage. Protective half logs are used to prevent cables from cutting into trees and minimize tree trunk degradation. Please help us protect the environment: Do not smoke or litter garbage when you are in our Park. SAFETY Throughout the entirety of the Circuits you will remain attached to a life-line support. Patrol Guides will also be situated along the circuit ready to advise and assist as needed – giving support from above and below. Before starting the activity on the Circuits, every client must follow the Safety instructions by our Patrol Guides.will explain how the circuit works, how to use the equipment, and provide all safety instructions which you need to respect at all times. The construction of Bali Treetop Adventure Park and all materials and equipments comply with European Standards EN 15567-1, and our Park is built, maintained and managed by a French management.